Christine Wong Yap, All the Steps in the Process: a research project on collaboration, 2015, drawings, furniture, and ’zine, dimensions variable. 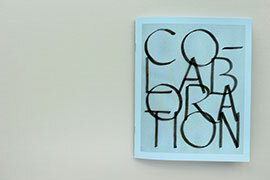 Various artist-collaborators’ submissions screening as video. 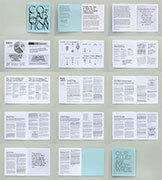 Download the ’zine, CO-LABORATION (PDF, 1.1 MB). 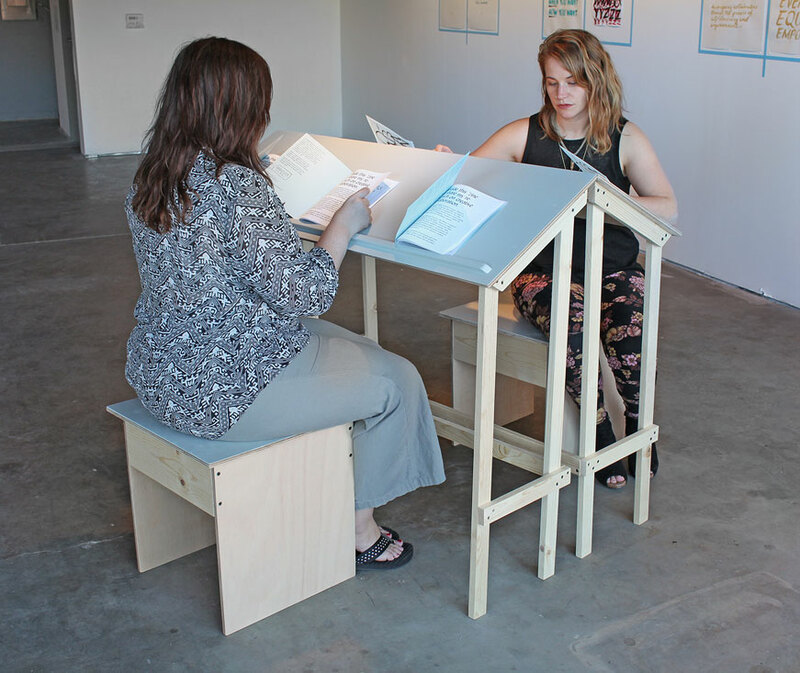 Reading desks, 2015, sande plywood, pine, paint, 40 x 48 x 14", 18 x 18 x 18". 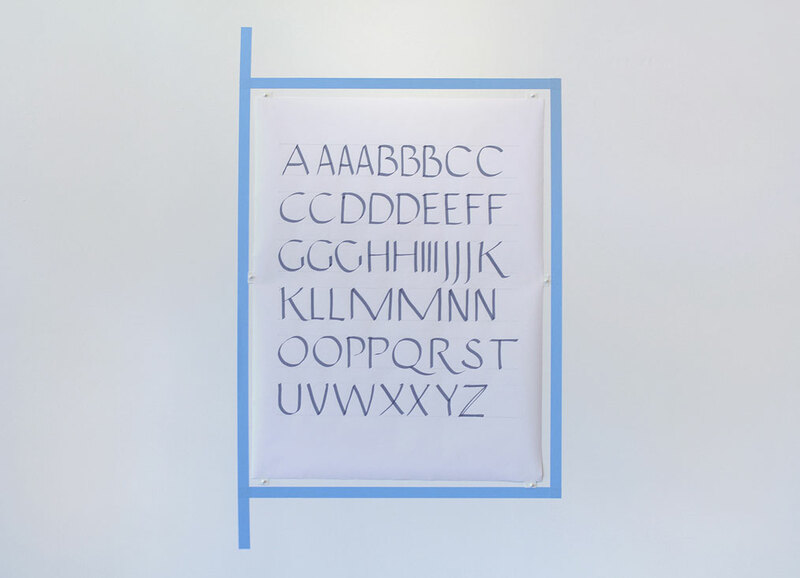 Hand-lettering sampler: roman capitals, 2015, ink on paper, tape, 24 x 18". 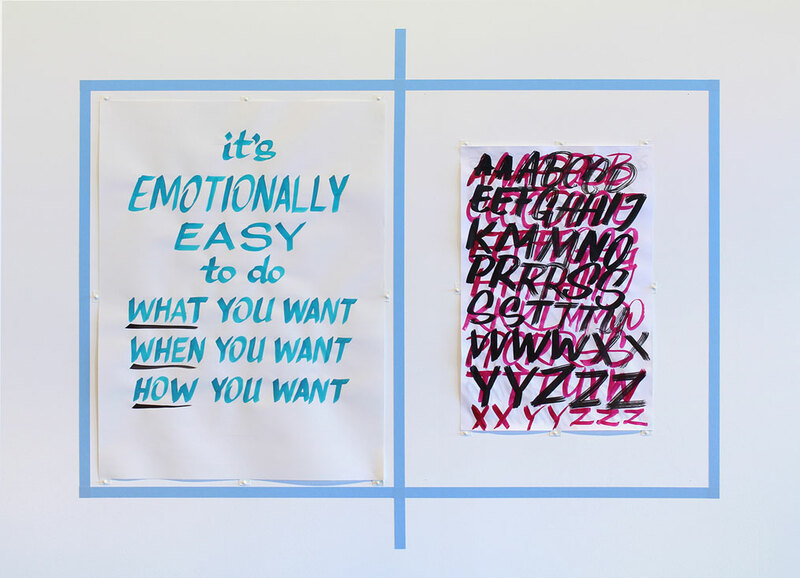 Hand-lettered drawings (“It is a concerted practice to value all types of work and all steps in the process equally.” —Elizabeth Travelslight) and samplers, 2015, ink on paper or vellum, tape, 11 x 8.5” to 12 x 18" each. 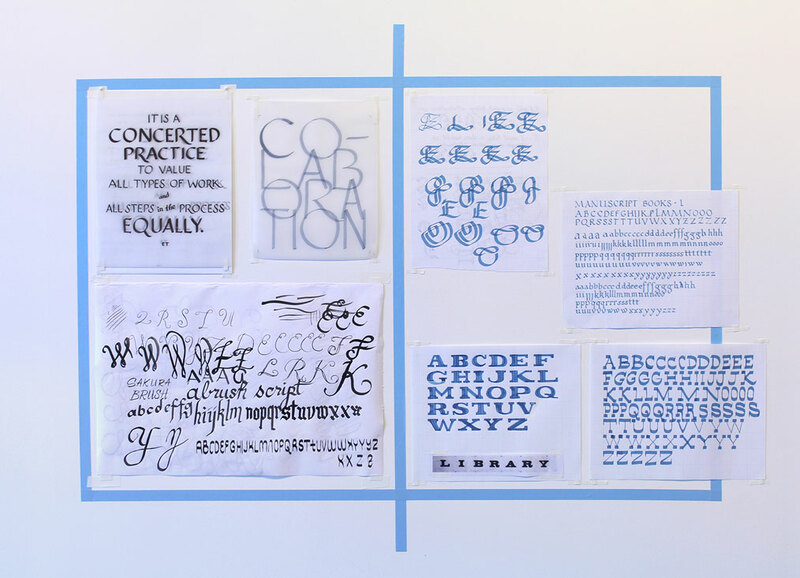 Hand-lettered drawings (“Collaborators are built through practice, attention, discipline, passion, commitment, and habit.” —Twyla Tharp, The Collaborative Habit, 2009, Simon & Schuster. 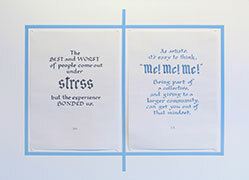 “The more a project or idea can be shared across different perspectives and experiences, the richer it will be.” —Kevin B. Chen), sampler, survey, 2015, ink on paper or vellum, tape, 11 x 8.5" to 24 x 18" each. 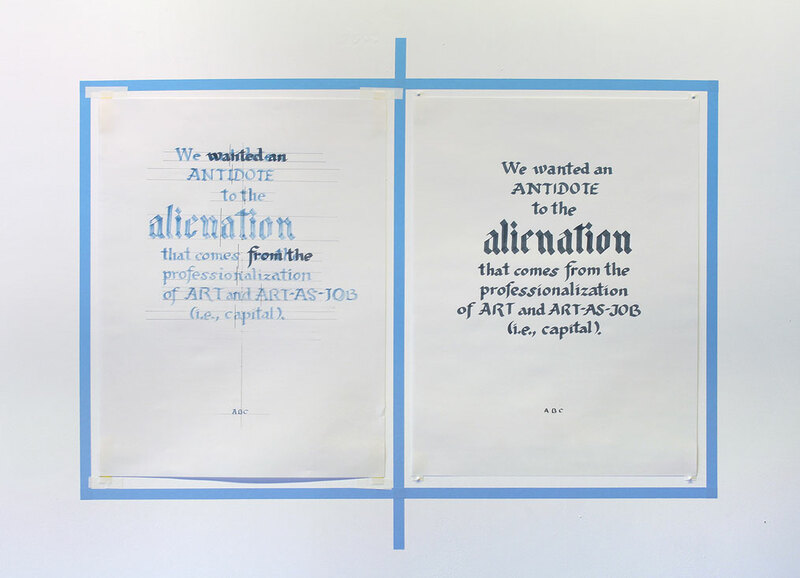 Hand-lettered drawings (“We wanted an antidote to the alienation that comes from the professionalization of art and art-as-job (i.e., capital).” —Amanda Curreri), draft, 2015, ink on paper, tape, 24 x 18" each. 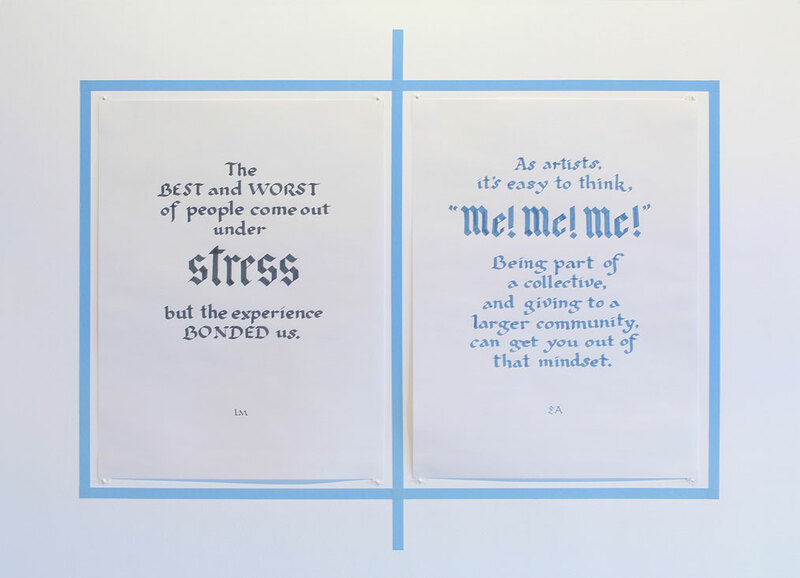 Hand-lettered drawings (“The best and worst of people come out under stress, but the experience bonded us.” —Leeza Meksin. 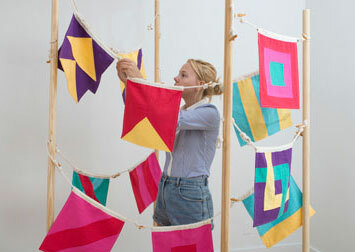 “As artists, it's easy to think, ‘Me! Me! 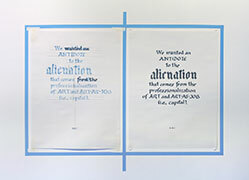 Me!’ being part of a collective, and giving to a larger community, can get you out of that mindset.” —Eleanna Anagnos), 2015, ink and pencil on paper, tape, 24 x 18" each. 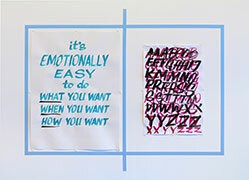 Hand-lettered drawing (“It’s emotionally easy to do what you want, when you want, how you want.” —Elizabeth Travelslight), 2015, brush-stroke specimen sheet, 2015, acrylic on paper, tape, 24 x 18", 18 x 12". 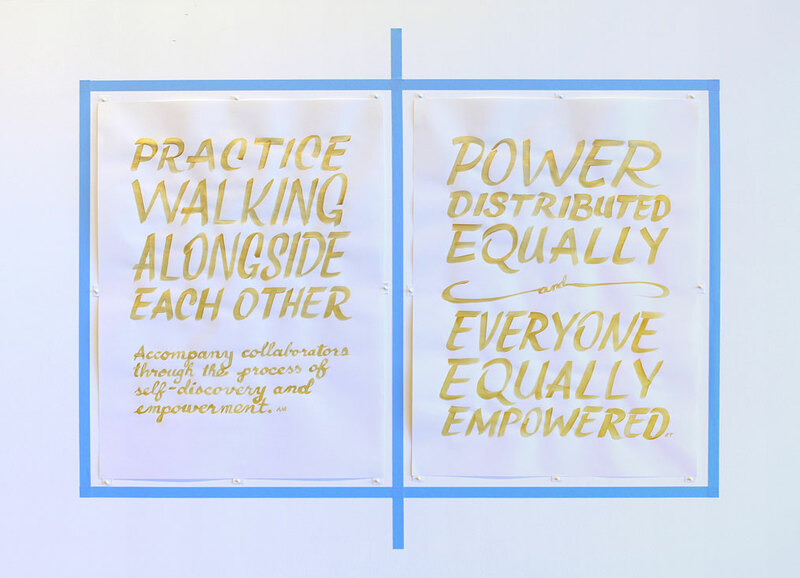 Hand-lettered drawings (“Practice walking alongside each other. 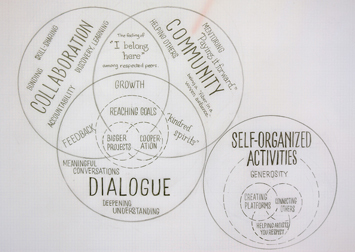 Accompany collaborators through the process of self-discovery and empowerment.” —Armando Minjarez. 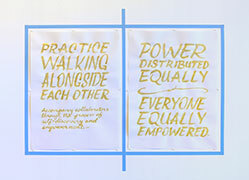 “Power distributed equally, and everyone equally empowered.” —Elizabeth Travelslight, 2015, acrylic on paper, tape, 24 x 18" each. 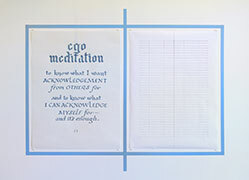 Hand-lettered drawings (“Ego meditation: To know what I want aknowledgement from others for, and to know what I can acknowledge myself for, and that’s enough.” —Elizabeth Travelslight), 2015, ink on paper, tape, 24 x 18" each. 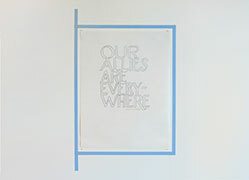 Hand-lettered drawing (“Our allies are everywhere.” —Jessica Tully via Kevin B. Chen), 2015, ink on paper, tape, 24 x 18". 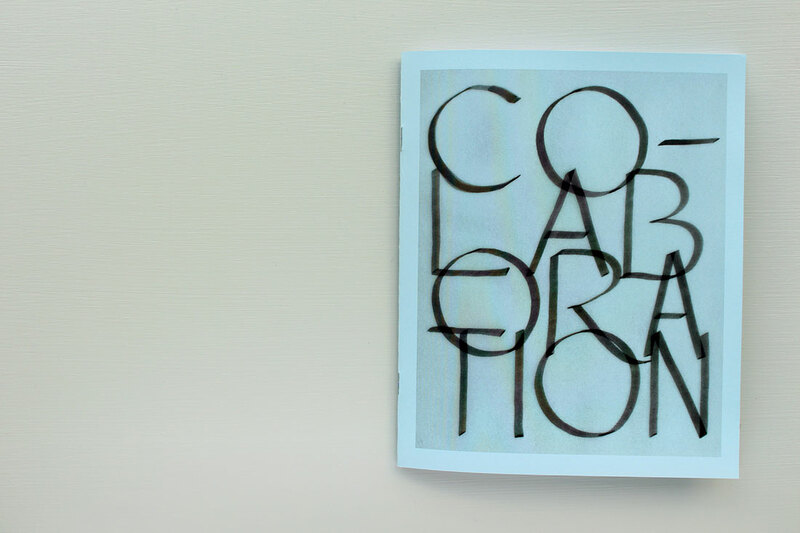 CO-LABORATION, ’zine edited and designed by the artist, 2015, photocopies, 28 pages, 8.5 x 7", 150 copies first printing / open edition. 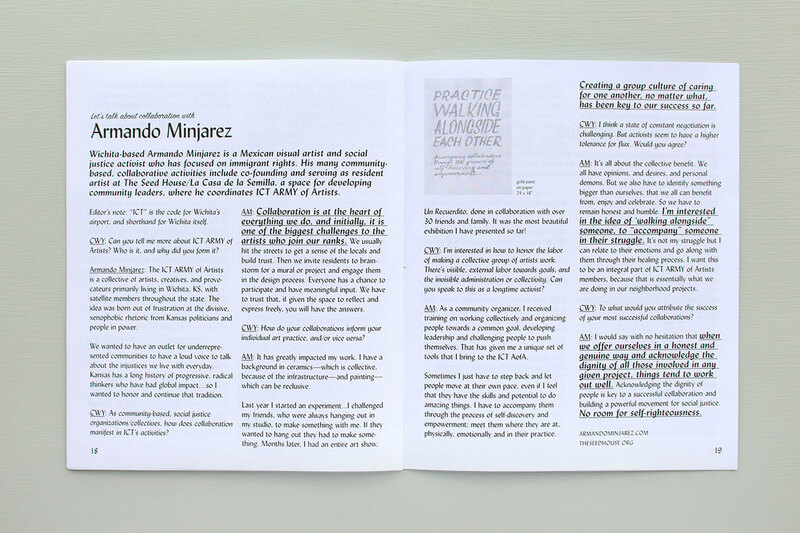 Interview with Armando Minjarez on The Seed House/La Casa de la Semilla and ICT ARMY of Artists (Wichita, KS), alongside interviews with Kevin B. Chen, Amanda Curreri, Leeza Meksin and Eleana Anagnos, Elizabeth Travelslight, and Linnebur & Miller. 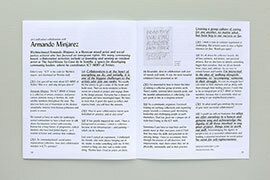 Download the ’zine, CO-LABORATION (PDF, 1.1 MB). 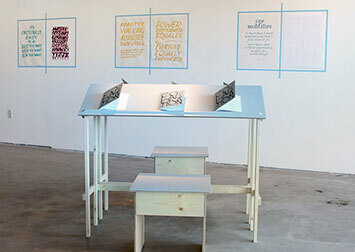 All the Steps in the Process: a research project on collaboration is a series of hand-lettered drawings, wood furniture, and a ’zine examining working creatively with other people. 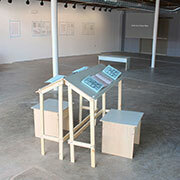 I conducted six interviews with eight artists from Wichita, the San Francisco Bay Area, and New York. 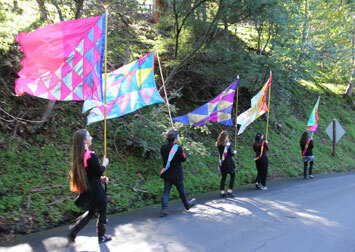 With the help of Harvester Arts and Calie Shivers, I initiated a survey completed by 50 people near and far. 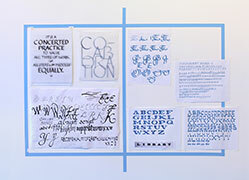 This research is reflected in hand-lettered drawings exhibited alongside process sketches in an exhibition design inspired by publication layout. 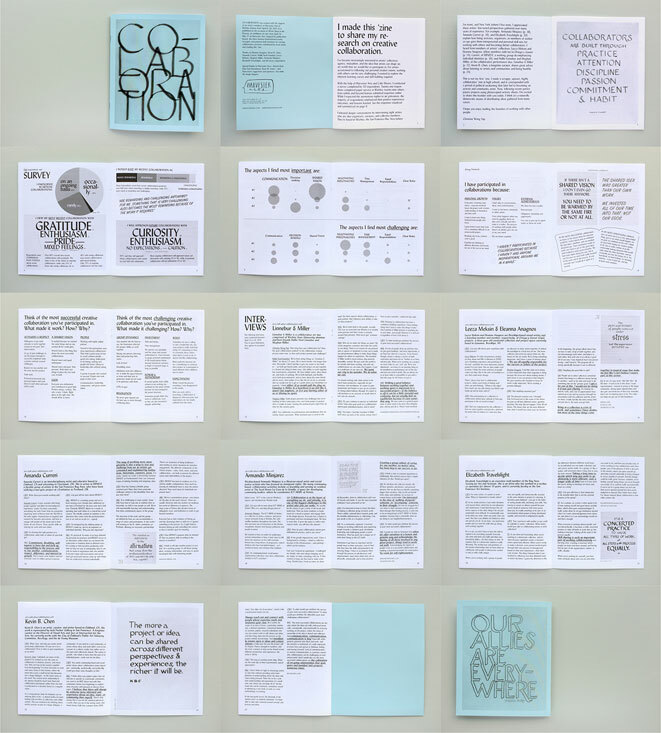 The survey data is visualized and longer excerpts of the interviews are compiled in CO-LABORATION, a 28-page ’zine I edited and designed. 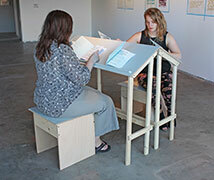 I built a pair of reading desks and stools for reading the ‘zine, and a bench for viewing examples of collaborative works submitted by local artists, writers, and media-makers. 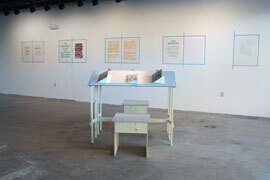 Participating artist-collaboratives are Amanda Pfister & Manda Remmen; Jennifer Koe & Nathan Filbert; Ann Resnick with Bethel Kidrun retirement community residents; Kevin Mullins in response to the work of Anne Schaefer; and Jessica Wasson, Patrick Calvillo, Alex Thomas, Ian Blume, Gray Brand, Bernardo Trevizo, Drew Davis, Jordan Kirtley, Peter James, and Tim Maggard. 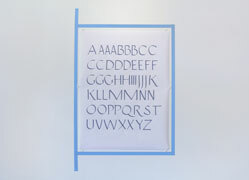 A list of their works can be found here (PDF, 35 kb). 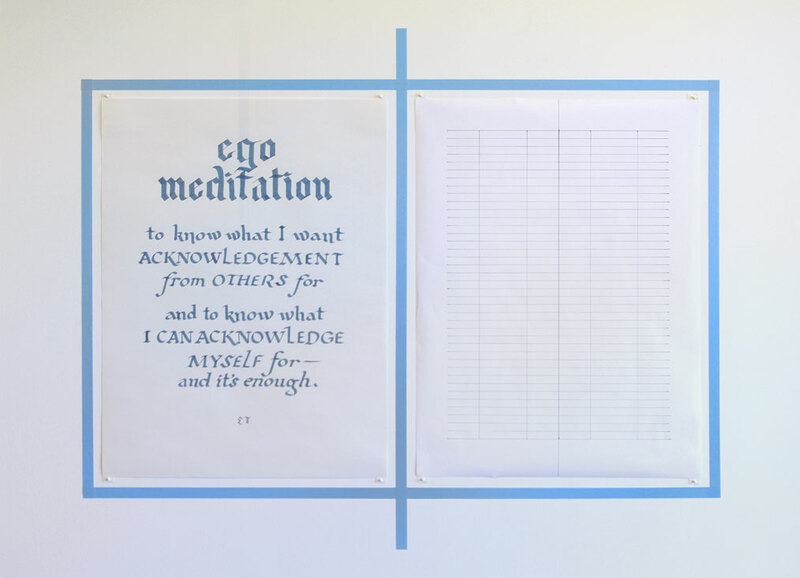 All the Steps in the Process will be on view from April 24 to May 17, 2015 at Harvester Arts, 215 North Washington Avenue, Wichita, KS. 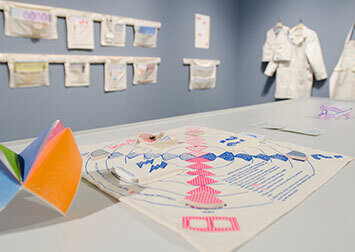 It was developed with the support of a Harvester Arts residency from April 8 to 24. 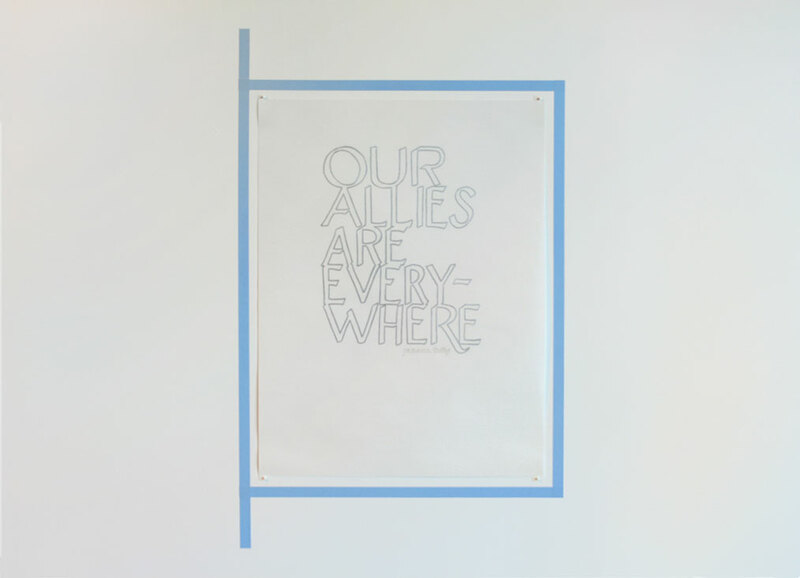 Special thanks to Harvester Arts; co-founders Kristin Beal, Kate Van Steenhuyse, and Ryan W. Gates; supporters including Sean Anderson, Mark Van Steenhuyse, Calie Shivers, and Bernardo Trevizo; sponsors and funders; and everyone who attended the events. Thanks to Kevin B. Chen, Amanda Curreri, Leeza Meksin and Eleana Anagnos, Armando Minjarez, Elizabeth Travelslight, and Linnebur & Miller, and survey respondents for sharing your wisdom. 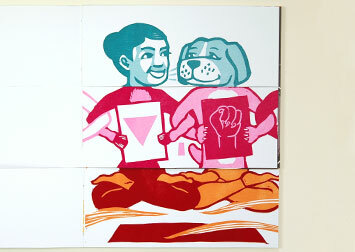 I couldn’t have done it without you. 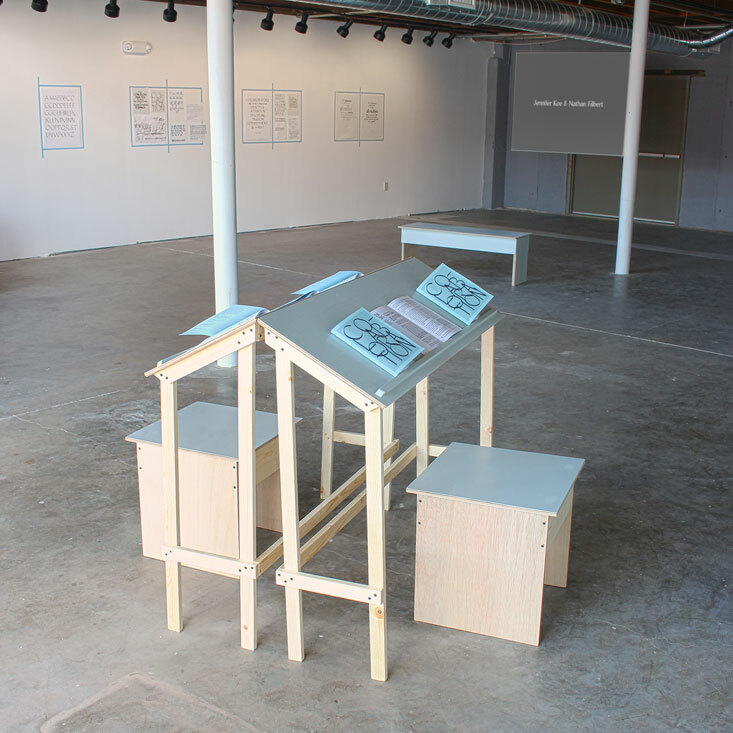 Caption: Christine Wong Yap, All the Steps in the Process: a research project on collaboration, 2015, drawings, furniture, and ’zine, dimensions variable. 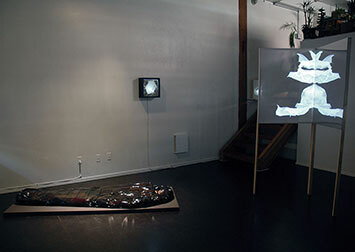 Various artist-collaborators’ submissions screening as video.